Have you heard the news? Now is a perfect time to join the Simply Creating team! 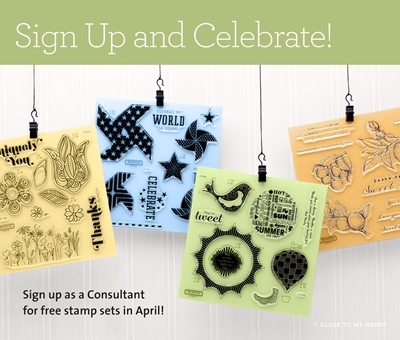 When you join our team during the month of April, you will get the Stamps-of-the-Month from April all the way to July for FREE! Not only are free stamp sets an awesome deal, but it’ll give you a great heads up on preparing beautiful projects for your new business or just for the fun of it. Not sure? Think about what an extra several hundred dollars a month would mean for your family. What would you get to do? What would you get to do with or for your family? What would you buy? Would you pay off some debt? Would you splurge on your favourite products? Would you get that vacation you’ve been saving for sooner? What difference would it make? If you think you might be interested in learning more, email me. (You’ll find my address by clicking on view my complete profile.) We’ll set up a time to chat or meet and I can answer your questions and help get you started. Ready to start now? Click here to sign up, and then email me to share your excitement! !